Rep. Eric Swalwell (D-CA) speaks to constituents. Rep. Eric Swalwell (D-CA) visited the IOP on Tuesday to discuss his involvement in the Mueller investigation and a potential run for president in 2020. Lynn Sweet, the Chicago Sun-Times’ Washington bureau chief, moderated the event. Swalwell has represented California’s 15th Congressional District since he unseated 40-year incumbent Pete Stark in 2012. He sits on the House Judiciary Committee and the Permanent Select Committee on Intelligence. Swalwell has been heavily involved in investigations into the Trump administration on both committees. Sweet noted that Swalwell had arrived in Chicago on Tuesday after visiting Iowa—an early primary state in the Democratic presidential primary—for the 20th time since 2016. 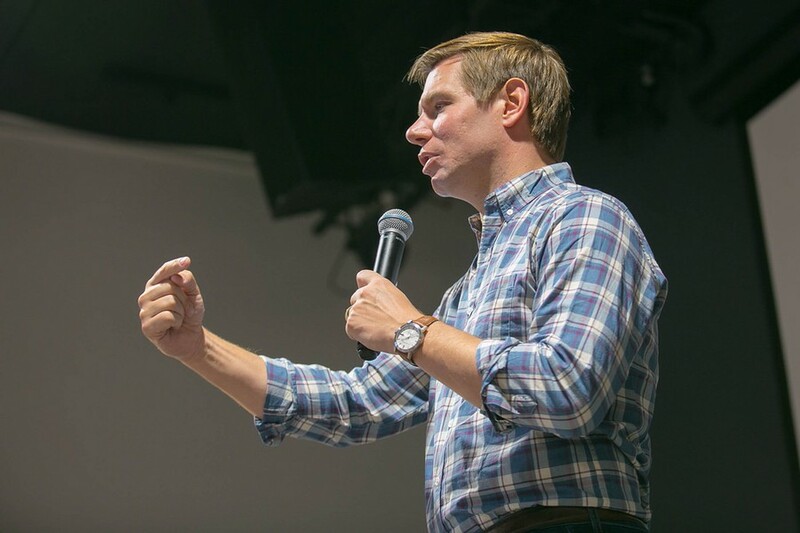 Swalwell was candid about considering a run for president, saying: “if I run for president I would make gun violence a top three issue.” He also highlighted student debt relief, combating climate change, healthcare reform, and addressing racial inequality as key issues of his potential 2020 campaign. Swalwell said he would make a decision about a presidential bid by the end of March.